Whenever they invite us over I always bring something along. 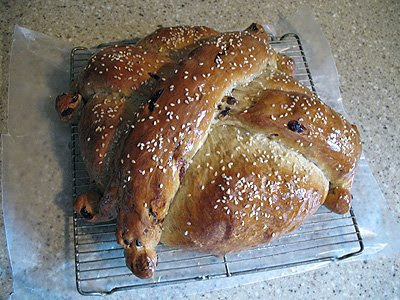 The timing was perfect as the next recipe I needed to conquer from The Bread Baker’s Apprentice as part of the BBA Challenge was Artos, otherwise known as Greek Celebration Bread. I chose one of the options, the Christmas version, called Christopsomos, which is a sweet bread flavored with cinnamon, cloves, and nutmeg. It involves adding raisins, walnuts and dried cranberries and is then glazed with a honey and orange extract mixture and sprinkled with sesame seeds. I wasn’t sure if I would have time to make the Christopsomos, so I also opted for a Greek apple pastry called Milopita. Sam, a Twitter friend and fellow food blogger, who just happens to blog about Greek food, shared his gorgeous recipe with me. While mine didn’t turn out as stunning as his, I plan to try it again and again until I get it right as it was a huge hit! The first time (yes I made it twice) I made this I used a regular pie plate. Thank goodness I have grown used to placing my pans on a cookie sheet and I saved myself from scrubbing an oven disaster. The batter baked up and just didn’t have enough room in that pan, hence it bubbled over and out onto the cookie sheet. 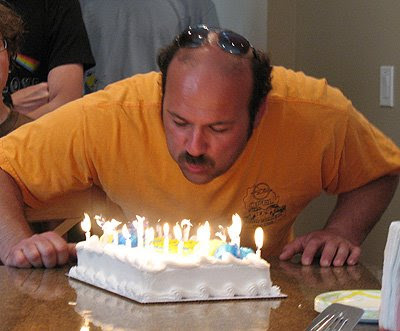 While it still tasted fabulous, it was certainly not presentable enough for Pete’s birthday. So I kept that one for us (my daughter almost polished it off by herself from Saturday into Sunday) and proceeded to make the second one, this time in a 9″ springform. Technically this recipe calls for a pie plate, and I asked Sam what he used. 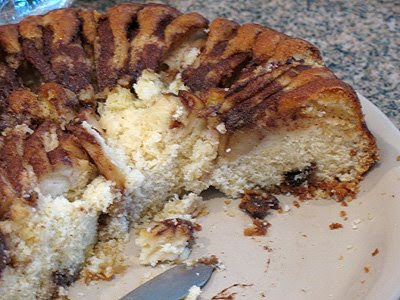 He used a 9″ DEEP DISH pie plate, so be sure and use deep dish if you try this. Sift flour with salt (and the baking powder if required). 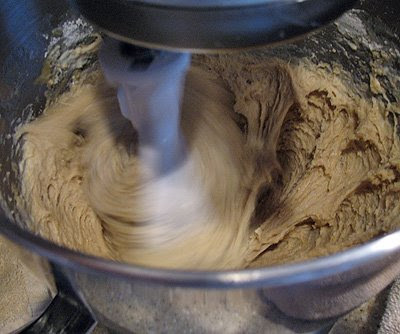 Using a mixer, cream ½ cup of the butter and the 1 cup of white sugar until smooth. 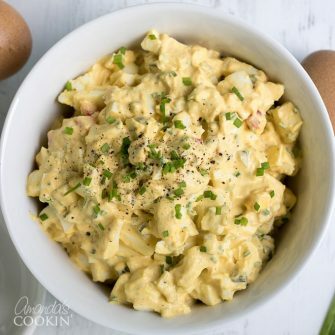 While continually mixing, add the egg yolks one at a time alternating with a tablespoonful of flour in between yolks to achieve a smooth and creamy consistency in the mix. 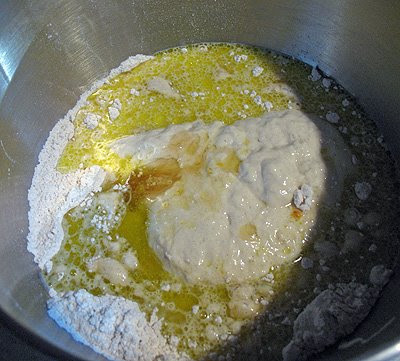 Add the rest of the flour in stages, alternately adding the milk in stages as well. Then add the vanilla extract and lemon rind and mix until the batter is smooth. In a separate mixing bowl, whip the egg whites into stiff peaks and then using a spatula, carefully fold them into the batter. Butter the sides of a pie baking dish and pour in the finished batter. 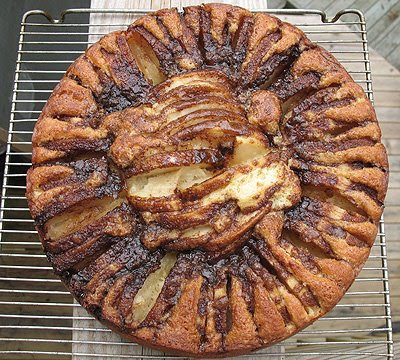 Arrange the apple slices in a perpendicular fashion overtop of the batter in a circular pattern to form an outer ring of apple slices. Fill the center of the ring with any remaining slices. 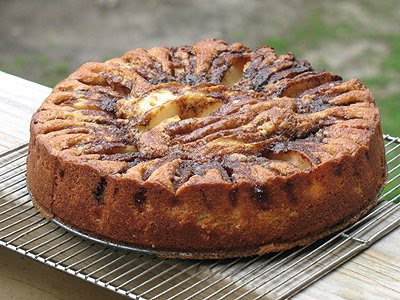 Melt the remaining ¼ cup of butter along with the ¼ cup of brown sugar, mix in the cinnamon and pour the mixture over the apple slices in a circular fashion, making sure to distribute it evenly in a long even stream. Place baking dish in an oven pre-heated to 350° F. and bake for approximately 60 minutes (mine was 50-55).Let the Milopita stand to cool for at least a couple hours before serving. Next up, The BBA Challenge: Artos. 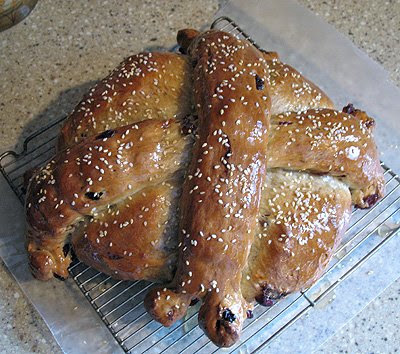 Artos is a Greek celebration bread, the version that I chose is traditionally served at Christmas. 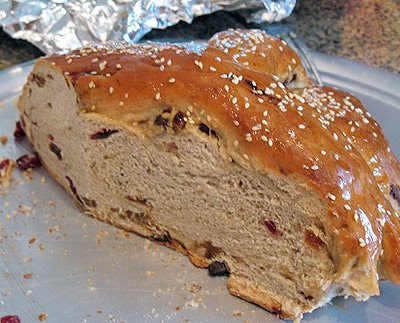 The flavors and additions are what attracted me to this amazing sweet bread. This was such a big hit at Pete’s house that he insisted that I leave it for him, he loved it that much. The kicker? For many, many years, Pete and his family owned a bakery, so what better compliment could I possibly receive? Well, how about this one –>> His sister in law’s mother was there visiting from Greece. She didn’t speak a word of English, so her daughter translated for me. She kept turning the bread plate around and pointing at different areas, asking what was in it, how the glaze was made, and then asked me for the recipe. How could I possibly be any happier?? She has made similar breads (Artos) in the past, but loved this version and wants to try it herself. :) Success! First off, this bread calls for using a poolish. 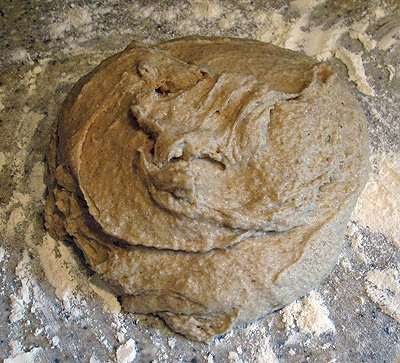 A poolish is basically a bread starter, consisting or water, flour and yeast, then allowed to rest in the refrigerator overnight. I had a few blunders with this recipe and was concerned that it was even going to work out at all. Hubby wants me to make another, only this time I think I will do the braided version for us. YUM! First you measure out a cup of poolish and let it sit at room temp for an hour, then add it together with flour, salt, yeast, cinnamon, nutmeg, allspice, cloves, orange extract, eggs, honey, oil and warmed milk. Although, I blundered and used cold mix it still worked out fine! 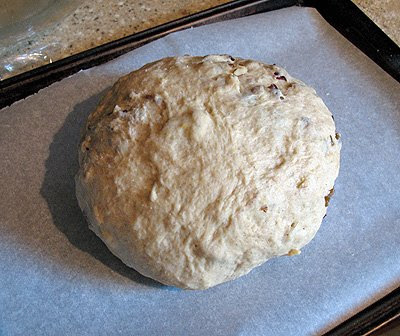 Then turn it out onto a flour surface, adding flour to make a tacky, but not sticky, dough. Knead for ten minutes. 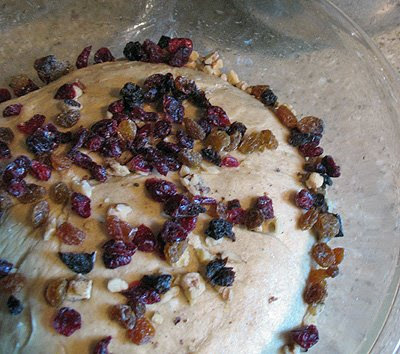 Add in the raisins, cranberries and nuts the last two minutes of kneading. Let it rise in an oiled bowl for 90 minutes, or until doubled. Again, another blunder, I realized after I had placed it on the cookie sheet to rest, which is about an hour and a half later than I was supposed to. Added them in, cursing a few times, mumbling to myself that I needed more coffee. Next you have to separate the dough in two pieces, 1/3 and 2/3. Put the 1/3 piece into a plastic bag in the refrigerator to chill. Form the remaining 2/3 into a boule, which is a tight ball, pinching the ends underneath so that the dough will bake up into a ball and not spread out. Then place it on the cookie sheet, cover with plastic wrap, and let rise another 60-90 minutes. When the dough is ready to be baked, you remove the chilled dough from the refrigerator and separate into two piece. 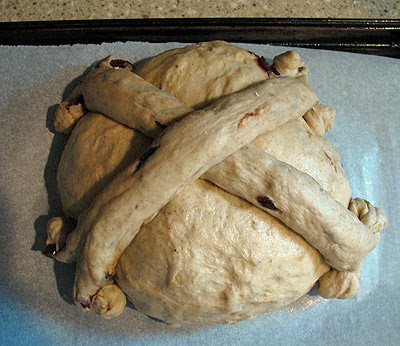 Roll into 10″ ropes and criss cross across the top of the dough ball. Cut the ends of the ropes and curl up. 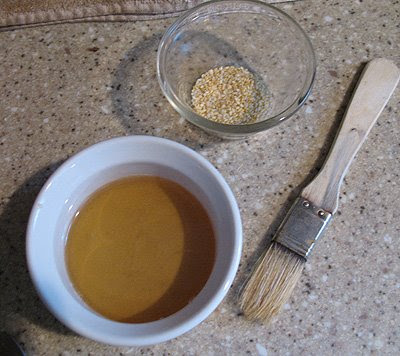 Once it’s baked, brush with glaze make from boiled sugar and water, honey and orange extract. Sprinkle with sesame seeds and let cool for at least an hour before slicing. From above, that gorgeous photo looked almost like a pecan pie! What a delicious recipe too. 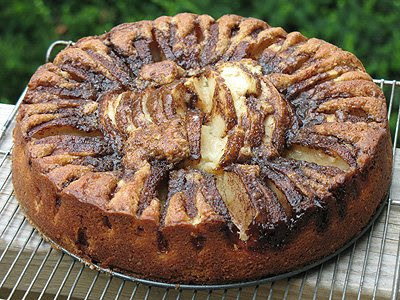 My boyfriend loves anything apple so I'll have to make him this. Wow, that's quite the compliment on the bread! 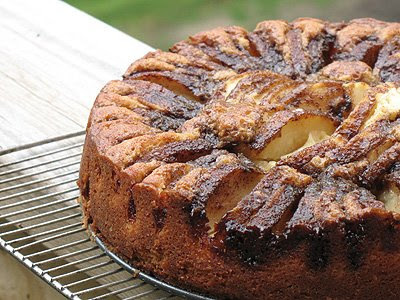 And your apple pastry/cake sounds delicious. Busy Busy busy….the milk thing has burnt me more than once. Another trick I learned is buttermilk can be frozen so I try to use that instead of whole milk since I can buy 1/2 gallon and freeze it in 1-2 cup quantities and pull before I need. Boy, you've sure been busy! That Greek pastry looks amazing. I bet Dorie's ice cream tasted awesome on top of Pete's pie/cake! 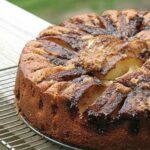 Both of these look fabulous, and the milopita is on my "must try" list – it looks glorious. They are both amazing. Making homemade bread is so rewarding. That cake is beautiful & the bread looks delicious! Pete is one lucky guy! Wow! Both look wonderful. I'm going to have to try the milopita. Your milopita looks delicious!!! Love it!!!! And the artos- perfection! You should be so proud of all the compliments from your Greek friends and family. I would certainly agree that it doesn't get much better that that. Both of those look great! I love making homemade bread, its too bad so many people are afraid to work with yeast! I would definitely say yours is stunning! Wow, Amanda, that's a wonderful batch of Greek baked goods you produced this weekend! Everything looks so good. I love how forgiving bread is – even with multiple little blunders, it still comes out picture perfect. 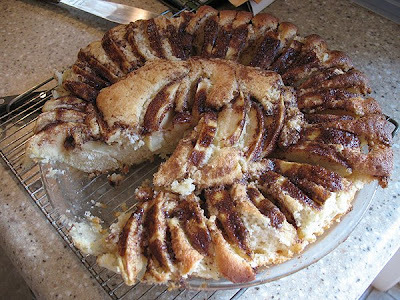 That apple pastry looks incredible! You did a fantastic job!